When Dennis requested a quote for his Italian Olive Oil product I immediately fell into nostalgia reminiscing my many childhood summer holidays around Italy and the Tuscany region. I was transported back to the glorious taste of pizza, pasta, garlic, basil and, of course, the magical taste of real Italian Olive Oil, with everything! My response clearly resonated with Dennis as, happily, he chose us to redesign his existing Shopify website. Although Dennis had never used WordPress before, we provide videos and written tutorials for all our clients new to using WordPress, so that changing platforms need not be so intimidating. Using the Divi Theme was a no-brainer and the Rise and Shine child theme we chose by Elegant Child Themes offered the kind of visual representation that I just knew would work well for Il Divino. 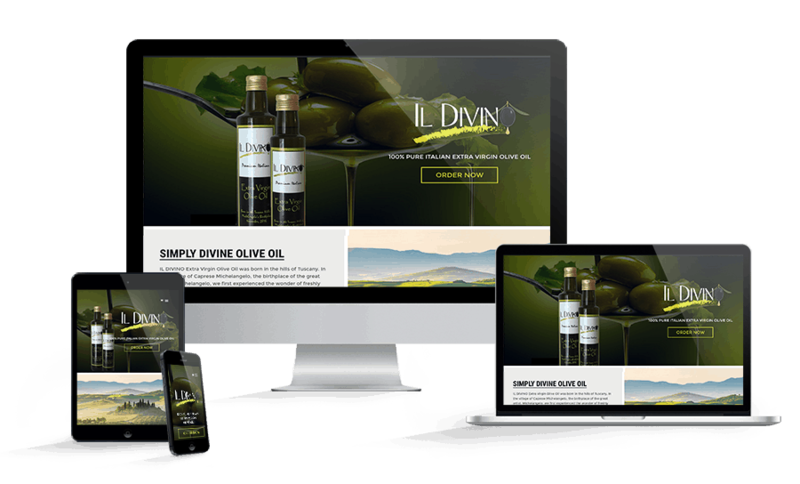 Whilst we did not use all the excellent functionality that comes with Rise and Shine, mainly the reservations and menu plugins, I felt the styling and page layouts were perfect for sharing Dennis and Kumiko’s journey to bring IL DIVINO Olive Oil to market. With a new brand design for the 2016 Olive Oil bottles, our brief was to move over to WordPress and create a design that matched the new look. The vector graphic in the contact section of the Rise and Shine Child Theme by Elegant Child Themes jumped out at me and inspired a search for a similar style image of Tuscany and Olives, and the imagery process started form there. Sourcing high quality imagery that complemented the brand was key to transforming a functional site into a site with some ‘wow’ factor. Selling the product involved installing the #1 plugin WooCommerce. One of the best features of this child theme are customised WooCommerce pages, including the Shop, Cart and Checkout. Due to more complicated shipping rates we opted for the premium Table Rates plugin to easily configure a variety of shipping rates depending on the cart contents.